Latest price of Realme C1 2019 2 GB RAM in India was fetched online from Flipkart, Amazon, Snapdeal, Shopclues and Tata Cliq. 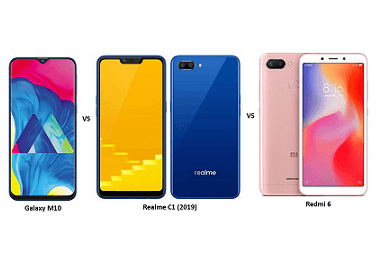 "Samsung Galaxy M10 vs Realme C1 (2019) vs Xiaomi Redmi 6: Price, Features and Specifications Compared"
If you are in the market for a premium looking phone that won't pinch the pocket, the Realme C1 2019 is an excellent choice! The affordable smartphone boasts a stylish appearance, a good display, a remarkable battery life, and a powerful processor. The C1 (2019) is fuelled by a Snapdragon 450 SoC Octa-core processor under the hood running at speeds of up to 1.8GHz, along with an Adreno 509 GPU. Coupled with 2GB of RAM, the handset performs well exhibiting no signs of sluggishness whether multi-tasking, browsing, using apps or gaming. Some standout features include Smart Assistant, Quiet time and a face unlock feature. The C1 (2019) cameras do a good job, especially outdoors in broad daylight. They include a rear-facing dual camera arrangement comprising a primary 13MP sensor and a secondary 2MP shooter, with LED flash, PDAF, and HDR support. The front-facing snapper for selfies is a 5MP unit with f/2.2 aperture that boasts an AI beautification mode for capturing intricate details and accurate skin tone. Videos can also be shot at up to 1080p resolution. The Realme C1 (2019) has 16GB of built-in storage which can run out pretty quickly. However, there is a provision of upgrading up to 256 GB via a dedicated Micro SD card. Talking of physicality, the C1 (2019) with a nearly bezel-less design is pleasing to the eye. Crafted primarily from plastic with a matte finish at the back, the unit is lightweight with thick sides for a comfortable grip. The device sports a 6.2-inch screen with HD+ resolution that delivers vibrant colours. And yes, it has a Corning Gorilla Glass panel for protection and a chic notched display. The handset is available in shades of Mirror Black and Navy Blue. The a massive non-removable 4,230mAh battery lasts roughly one and a half days in terms of daily usage so that you can enjoy your applications with ease. The Realme C1 (2019) runs on Android 8.1 Oreo operating system and has a ColorOS 5.2 user interface. On the connectivity front, the handset offers options like dual-SIM (both with VoLTE capabilities), Wi-Fi b/g/n, Bluetooth v4.2, GPS, FM Radio, Micro-USB port, compass and sensors like accelerometer, proximity and ambient light. Apart from overall good performance, decent cameras and a great battery the Realme C1 (2019) price is reasonable, which makes it an attractive purchase for budget-conscious consumers.